The paper describes the methodology developed in the first phase of an empirical study conducted in the Hararghe region of Ethiopia. 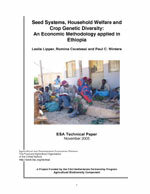 Purpose of the study was the analysis of the economic relationship between seed systems, access to crop genetic resources and farm level outcomes in order to understand how seed systems influence the on-farm conservation of crop genetic resources and the welfare of poor farmers. The objective was to provide the necessary information and tools for decision-makers on ways to promote the sustainable utilization of agricultural biodiversity and improve farmer welfare. By documenting the methodology and lessons learned in field work in Ethiopia, we hope to assist those wishing to conduct similar research in this area.